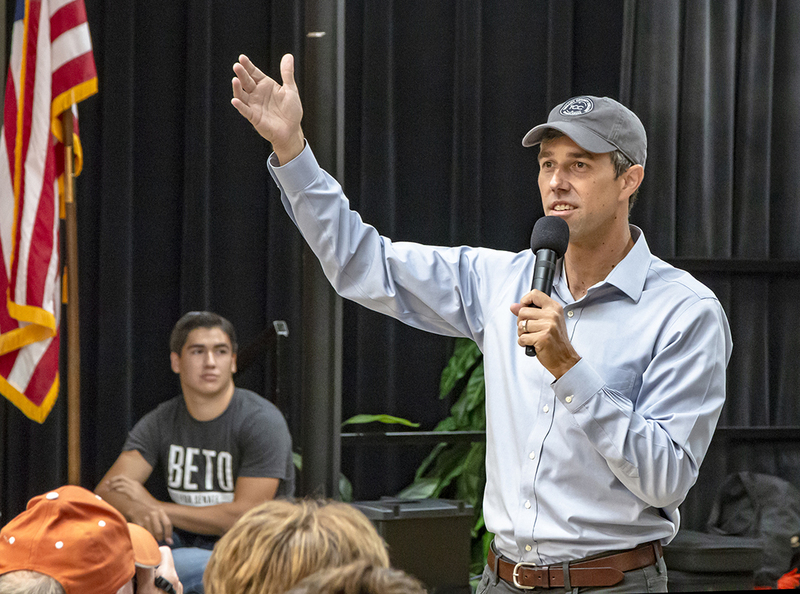 U.S. Rep. Beto O’ Rourke visited NE Campus Oct. 6 as part of a tour of local colleges to discuss his candidacy for the U.S. Senate. 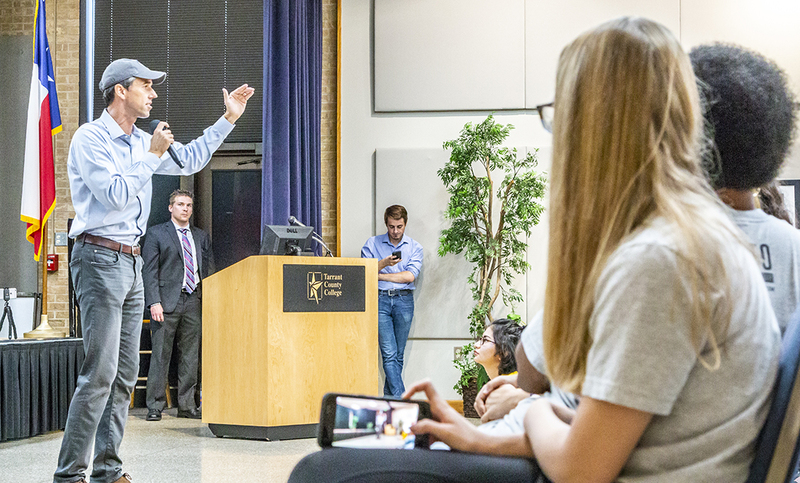 O’Rourke spoke to about 300 students and community members in Center Corner about issues ranging from immigration and global warming to criminal justice reform and health care. Prior to his speech, he spoke to The Collegian about student loan debt and the reasons why he is touring colleges such as TCC. 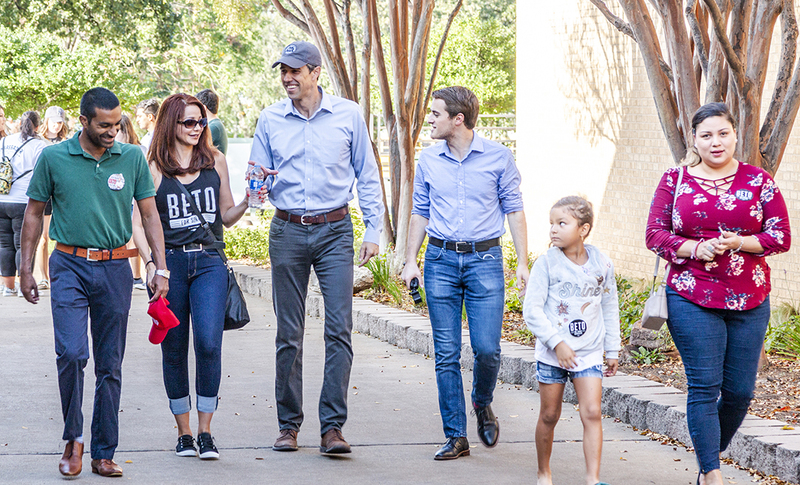 O’Rourke said one idea to address the crisis is to refinance outstanding debt at lower rates or forgive debt when the beneficiary works in a high-demand profession in an underserved community. He gave an example of forgiving debt for teachers willing to work in school districts that can’t recruit. “Let’s also invest as a country in the ability for anyone who wants to be able to come to Tarrant County College or El Paso Community College or get an associate degree without taking on a ton of debt,” he said. Investments should be made in programs that can allow people to earn more and pay back more over time, he said, whether that be community college students transferring to a four-year university or finishing a certificate in a technical program like welding. O’Rourke said people might wonder “Why come to Tarrant County College?” just 31 days before Election Day Nov. 6. For him, it’s not just about the prospective voters, but that there are a lot of leaders on campus who are also involved off campus, he said. The first issue O’Rourke discussed during his speech was immigration and the possibility of reform. He said children who are still separated from their parents at the border need to be reunited. O’Rourke discussed health care and said Texas is the least insured state. He highlighted the need for people to have access to primary, mental and specialty health care. O’Rourke also talked about criminal justice reform and the effects of mass incarceration for marijuana possession. While he doesn’t condone the use of marijuana for young people, he said those who use marijuana recreationally shouldn’t be charged with a crime. “We’re going to end the war on drugs by ending the prohibition on marijuana by expunging the arrest records of those arrested just for possession of something that’s legal in most of the country right now,” he said. All the seats set up in Center Corner were full for O’Rourke’s speech. Other people were standing lined up against the wall. Volunteer deputy registrars were set up at tables where attendees could register to vote. Mountain View College student Anthony Washington said he attended the event to register to vote but missed O’Rourke’s speech. He said he still filled out the information to register while at the event and feels motivated to vote in the upcoming election. 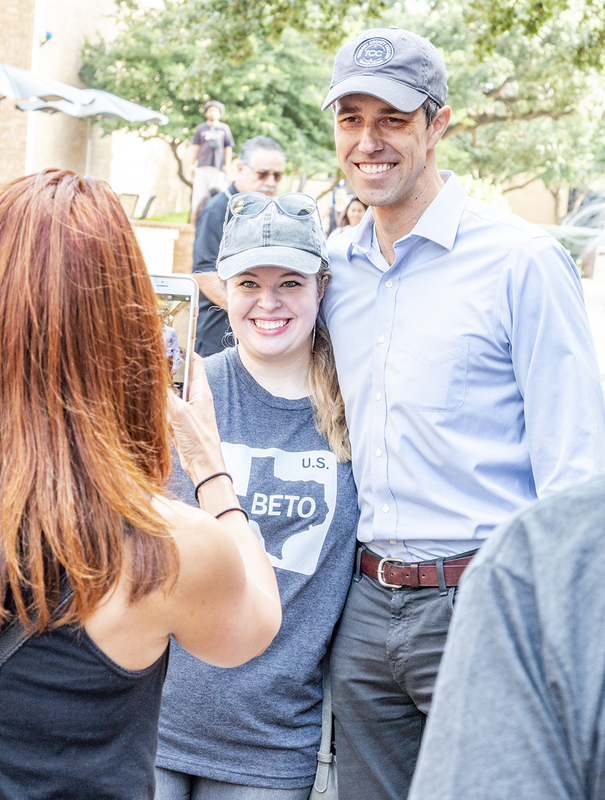 Washington found out about the event on social media through his friend, SE student and Beto campaign worker Tristin Barkley, who said he felt like politicians did little to make changes in his community. “We can talk about politics and ideological differences, but there’s a genuineness about Beto that doesn’t exist with [Republican Sen.] Ted Cruz,” Brooks said. A call to Cruz’s campaign office was not returned. NE student Andrew Fiorello has “leaned Republican” for most of his life and only learned about the event the day before. Fiorello said he didn’t know much about the candidate beforehand and attended to learn about O’Rourke’s political platform directly, not just through ads. Fiorello was “disappointed” there wasn’t a Q&A session and said he probably would have asked about more specifics on immigration reform. He didn’t say which way he was going to vote in November but said O’Rourke has an “interesting platform” that might persuade him to vote for O’Rourke. NE student Blake Williams also wished there had been Q&A time and would have asked more about prison reform. Williams said he has not been an active voter, and the upcoming election is the first time for him to vote in a Senate race. While he plans to do further research before voting, he learned at the rally he agrees with many of O’Rourke’s views. For all of the challenges O’Rourke talked about during his speech, he said it was going to take more than a partisan solution to solve the problems the country is facing.